Von Domi hab ich die "You cheer me up award" bekommen. Vielen Dank Liebe Domi! 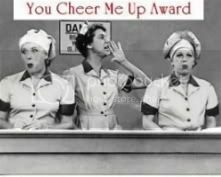 Ik kreeg van Domi de "You cheer me up award" Dank je wel Domi. I want to give the award to Beatrix and Marlene because they always leave such nice comments and make lovely sketches I can work with.